A Great Place for Pets! 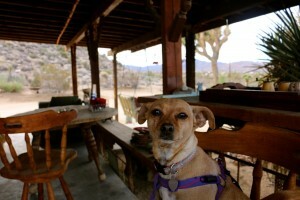 Thunderbird Lodge Retreat welcomes all pets for no additional fee! Each property has between 5 and 22.5 acres, and each has a fenced in area to keep the dogs and horses in and the deer and coyotes out. Check out a recent review left by a happy pet owner who recently stayed with us! The Thunderbird Lodge is the perfect place to bring your pets for a relaxing vacation in the Joshua Tree area. Lori is an easygoing and incredibly helpful host — was very patient with my “high energy” dog, Max. (She’s a true animal lover.) And she makes killer chocolate chip cookies! There is plenty of fenced in yard for larger dogs. My dog enjoyed running around on the dirt roads near the property leash free with me (the cabin is on the West edge of the national park — the cars that drive out that way drive slowly so it’s pretty safe around there.) There is a lot of wildlife for your dog to chase (rabbits, quail, kangaroo mice …) I normally don’t let my dog off-leash — but the area around the Thunderbird is one of the few places I feel comfortable doing that. The cabin itself is creatively decorated and homey with a full kitchen and bbq outside. And the view is spectacular. A great place to relax and get away from it all. I liked it so much, I moved to the area from LA after my visit to Lori’s place (seriously). I highly recommend it.